Rory McIlroy appeared to try to keep the celebrations to a minimum as he mourned the end of his relationship with Caroline Wozniacki. But he could hardly play it down for long after a stunning closing 66 saw him come from seven shots behind Thomas Bjorn and claim the BMW PGA by a stroke from a brilliant Shane Lowry. It was a memorable day for Ireland as the 25-year old Ulsterman became the first Irish golfer to win the PGA since Harry Bradshaw won at Llandudno in 1958. "It's been 18 months since I won on The European Tour and to win the flagship event, I could not have asked for any more," McIlroy said. "I knew coming in here I was playing well. I struggled a little on Friday but played great over the weekend. I was a little fortunate that some of the guys ahead of me made mistakes and I took advantage of it. "My caddie JP (Fitzgerald) set me the target of 15 under today. I didn't quite get there but 14 under was enough. I really wanted to win before going into the second Major of the season and I could not have asked for a better way to prepare." Bjorn came unstuck with a triple bogey seven at the sixth and limped to a 75 to finish tied third with Luke Donald (70) on 12 under as McIlroy set the target at 14 under with a birdie-birdie finish. Lowry had led by three strokes after starting he back nine with three straight birdies. But he double bogeyed the 13th and followed a two at the 14th with a bogey at the 15th to get to 12 under again. It proved to be a bridge too far for the Offaly man as McIlroy covered the back nine in a wonder, five under 32 to set the target at 14 under. Lowry needed an eagle at the last to force a playoff but ended up needing a 60 footer for birdie just to take solo second with a closing 68. Incredibly, he made the putt worth an extra €173,564, taking home €527,770 to move from 165th to 15th in Race to Dubai. After claiming € 791,660 McIlroy is now second to Bjorn in the money list with €1,295,825 from six starts. Had he won, Lowry would have qualified automatically for the US Open but he must now head to Walton Heath tomorrow for 36-hole qualifying. Expected to move to 75th in the world, he can still qualify for Pinehurst if he finishes in the Top 60 by June 9, which could force him to play the Norea Masters and the Lyoness Open over the next two weeks should Walton Heath not go to plan. "To be honest, I feel very unlucky," Lowry said. "I felt like I hit some great shots coming in, and like I hit probably best 5-iron of my whole year to 15, and ended up making bogey, which is a bit annoying, especially after bouncing back from a double with a birdie. And the double bogey, as well. "I know I hit a poor tee shot, and probably the only bush like that on the course and found myself in it and was struggling from there. But to hole the putt on the last and to finish second on my own is really nice. It's given me a lot of World Ranking points and a lot of Race to Dubai points, as well. "I tried to play 18 pretty much as a three-shotter all week. Hit my tee shot and heard the roar as I was walking down. I said to my caddie, he's up there making birdie. I didn't come here to lay up, I came here to win the tournament and to win the tournament, I had to make eagle. "Didn't hit a great second shot, got fortunate, hit a poor third shot and managed to hole the putt which was nice. "I knew I went three ahead after 12. To be honest I've struggled with that tee shot all week. I hit it left three times -- twice or three times up there, and, yeah, struggled. You can blast it into the crowd and be okay. I just struggled with that tee shot. I got a bit unlucky, hit a great putt on 17, and it just broke more than I thought. Obviously one short. "My season hasn't been going great but I did fancy myself coming in here, I really, really did. I love this place. And you know, I thought today was my day, but obviously not; hopefully next year." Paying tribute to McIlroy he said: "Rory, he's definitely one of the best golfers I've ever played golf with and I've been lucky enough to play a lot of golf with him. He's had his struggles over the last couple years and delighted for him, and obviously I'm a bit disappointed I fell one short myself." As for McIlroy, his first win on European soil means he will go to sixth or seventh in the world. His sixth European Tour International Schedule victory in his 134th European Tour event. Moves to €1,295,825 in The Race to Dubai. His first European Tour victory since the 2012 DP World Tour Championship, Dubai. Becomes the first player from Northern Ireland to win the BMW PGA Championship. Began the final day seven shots behind the 54 hole leader, Thomas Björn. This equals the largest final round comeback in the history of the Championship, set by Simon Khan in 2010. Only the second of his six European Tour victories where he has made up a final round deficit to win. Made up three to win the 2011 Hong Kong Open and seven at the 2014 BMW PGA Championship. His seven shot final round comeback is the largest since Robert Green made up seven at the 2010 Portugal Masters. His first European Tour victory in England and first on European soil. Becomes only the second Irishman to win the Championship and first since Harry Bradshaw on at Llandudno in Wales in 1958. The 50th Northern Irish win in European Tour history. 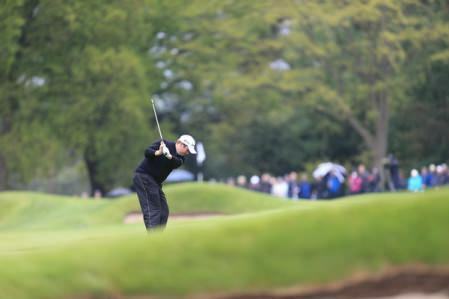 His 66 today marks the first time has broken 70 in the final round of the BMW PGA Championship. His 12th victory as a professional. The 46th different winner in the Championship’s 60th edition.